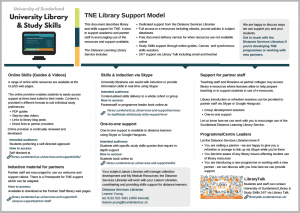 Below you will find information on how to make the most of your University of Sunderland Library Resources Access for Partner Staff. Find out what resources are included within your account how to access them and how library staff at Sunderland can support you. You can also visit the Distance Learner Library Blog. If you have not yet applied for access to University of Sunderland e-resources access, please click here to find out how you may do so. to source and recommend academic sources as part of your teaching. You have access to a subset of e-resources where licences allow. Students have access to all e-resources. You will be able to search Discover, however A-Z lists on the library web page and links that are routed through EZProxy will not work for you. Because of these differences some links on the library web page will be unavailable to partner staff. The screenshot below highlights the key links on the library web page for accessing resources and what is available to partner staff. Below we have recommended an approach to using University of Sunderland Library as a partner tutor. All University of Sunderland ebooks are accessed via the Library Catalogue. To begin, go to the University of Sunderland Library web page and enter your search terms (this could be keywords, a title or an authors name). Choose the ‘Books and eBooks button and click on the search icon. Make sure that you use the refining options on the left of the results to refine to view ebooks only. Click here to watch the ‘Searching for and reading ebooks‘ screencast. Use the following guidance if you wish to search for journal articles and see what is available or if you are demonstrating use of journal articles to students. Start your search at the University of Sunderland Library webpage. If you choose ‘Journal Articles’ and type your search terms you will be prompted to log in with your University User ID and password and be taken to ‘Discover’ – our system for searching journals. you are being prompted to login to an external provider using the EZProxy server. When you click on the green ‘Available’ link, you are taken to an external database to access the full text. If the database is authenticated using the EZProxy server you will not be able to access the full text via this method because partner tutors cannot access EZProxy. If this is the case you should follow the instructions on accessing the full text directly from the database provider (below). Make sure you make a note of the bibliographic details of the journal article you wish to access. the article you wish to view is not included within the partner staff resources. Due to licences only a subset of resources are accessible by partner staff. Check whether the database you wish to search is included within the partner staff access (the list is in the ‘What Resources are Available’ tab. Browse for the University of Sunderland and find the University of Sunderland Single Sign-on page. Log in. You should be transferred back to the database where you can begin to search. My Module Resources is the online version of module reading lists with direct links to the resources. There is a link to My Module Resources on the Library web page. you are being prompted to login to an external provider using the EZProxy server. Permalinks to Discover are generated using the Sunderland proxy server EZProxy as the method of authentication. As partner staff cannot login via EZProxy, these links will not work for you (they will work for students). If this is the case you should follow the instructions on accessing the full text directly from the database provider (above). Remember to log in to databases via an ‘Institutional Login‘, ‘Academic Login‘ or ‘Shibboleth‘. Yes, we reviewed our licences in March 2018 and have updated the resources available to partner staff. You can now access ebooks in the same way that students would, via the search box on the Library web page. Watch our ebook screencast for a demonstration or download or ebooks pdf guide. I cannot login with my User ID and password? You may wish to contact University IT to check your User ID or to have your password reset. You can contact them by telephone (+44 (0) 191 5153333) or by making a request on ‘My IT Portal‘. Some access methods to Sunderland e-resources are for students only. This is because the link uses a proxy server and we do this to make the experience for students much easier when they are off campus. It does mean these methods are not available to partner staff – if you have tried accessing resources through the ‘Journal Titles’ or ‘Database A-Z’ links on the library web page, you will find that that pages do not load for you. You may also just see a white page with an error message. If you are experiencing an issue logging directly into a database it may be that you are entering your login details to an incorrect login box. Most databases have multiple login options for their range of customers. The most prominent one is usually for individual subscribers. University of Sunderland students, staff and partner staff should always look for an ‘Institutional’, ‘Academic’ or ‘Shibboleth’ login. This will enable them to find the University of Sunderland single sign-on page and log in with the University User ID and password. Visit ‘Tips for logging into e-resources’ for more information and guidance. Partner staff have access to a subset of resources where licences allow. This means that when you search you may find the abstract or details of a journal article, but the full text may not be available to you. If you started your search on the library web page, it is likley the reaosn for this is that the article you have found is on a database that is not available to partner staff. Students, University of Sunderland staff and partner staff will only be able to access the full text of an article when it is within our subscriptions. If you are logged in correctly, and neither you nor your students can see an article it must be in a journal that we do not subscribe to. Students can use the document delivery service to obtain journal articles when they are not available online. Contact the Distance Services Librarian to arrange online training on using Sunderland e-resources. We can provide group or one-to-one training and can use Skype or Google Hangouts to run these sessions. Visit the Study Skills library web pages to access the full range of guides and support. University of Sunderland Library staff are here to support students at your institution who are studying on Sunderland programmes. Visit the Library web page for partner staff for more information about this and the other ways we can support your teaching. Students at the University of Sunderland have full electronic access to the library and a range of dedicated support services. Check the web pages for distance learning students for more information.